Find TV deals in your area using our postcode checker. Virgin Media’s new super-fast broadband packages combine great value unlimited broadband with TV & phone bundle options up to 200Mb speeds. Get award-winning broadband plus calls from BT with optional digital TV — including BT Sport — available, too. Award-winning TalkTalk offer broadband, TV and home phone package deals at competitive rates. Get superfast broadband, calls and award-winning TV content with Sky. All TV packages include Sky Q, Sky's revolutionary set-top box. EE offers a selection of broadband, calls and TV packages at favourable rates. 4G mobile MiFis also available. Now TV offers flexible TV, broadband and home phone bundles, with the best of Sky's Sports, Movies and Entertainment channels. Access over 9,000 films and over 1,000 box sets, including first-run series from overseas. Free one-day shipping from Amazon included in Amazon Prime membership. TVPlayer lets you stream live Freeview channels for free, or you can get a subscription to watch 98 channels, including Discovery, Eurosport and other pay TV. This is uSwitch’s TV provider directory, where we’ll outline the different providers on our site and what they offer. Whether you’re after TV bundles with all the bells and whistles or a stripped-down streaming service and Freeview, we’ve got you covered. 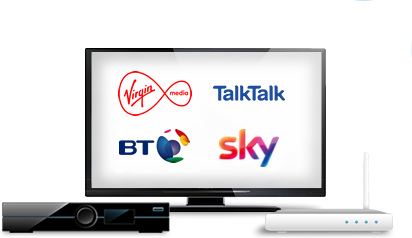 Here in the UK, there are four main TV providers, each offering broadband and TV bundles with as many channels as you want. Virgin Media offers high-speed broadband and tons of TV channels, depending upon which package you choose. Player is the most basic, with over 70 channels and broadband speeds up to 100Mbps. The top package is the VIP bundle, which includes over 245 channels — including BT Sport and Sky Sports — and broadband speeds up to 200Mbps. There are several packages in between the two which offer a wide range of channels and broadband speeds between 100 and 200Mbps. When most people hear the phrase ‘premium TV’, they think of Sky. Sky has three different TV packages, each offering over 270 channels — including Sky Atlantic so you can watch Game of Thrones and other hit series from the US. Box Sets is the top-tier package and has over 350 channels available, plus box sets to watch on demand whenever you want. You can mix and match Sky TV bundles with broadband speeds ranging from 17Mbps to 76Mbps. BT offers less channels than Virgin and Sky — but at a lower price. Starter includes Freeview channels, Entertainment Plus has 110 channels and Total Entertainment tops out at 141 channels, plus free BT Sport. All BT TV packages come with a YouView set-top box so you can pause, rewind and, depending upon your set-top box, record live TV. You can also watch Netflix through the YouView box. TalkTalk’s basic TV package comes with Freeview, but you can supplement your TV package with a TV Boost, which is a themed monthly add-on. TalkTalk offers TV Boosts to give you extra entertainment channels — like FOX, MTV, Sky 1 and Comedy Central — kids programming and international TV series. You can also easily add and remove Sky Sports and Sky Cinema, and BT Sport is available through TalkTalk, too. If you don’t need a lot of channels, you can get away with a stripped down TV package with just Freeview and access to the apps you watch. Here’s what you can watch on Freeview. EE TV lets you watch Freeview on the EE TV box. You can also watch premium TV content through the NOW TV app, which gives you the likes of Sky Atlantic, Sky Sports, Sky Cinema or kids programming. All of the big four providers — Virgin, Sky, BT and TalkTalk — offer basic Freeview packages, too, and most of their set-top boxes let you watch apps on your TV without needing another device. Here’s a comparison of basic TV packages. As streaming services produce more of their own series, more and more people are switching over to watching just streaming services. NOW TV is a streaming service from Sky that lets you watch select themed bundles of channels on a daily, weekly or monthly basis, depending upon which pass you choose. They offer a Sky Sports pass, a Sky Cinema pass, a Kids pass and an Entertainment pass, which includes 12 pay TV channels, including Sky Atlantic. Box sets are also included with the Entertainment pass. What you get with NOW TV depends on which pass you choose. Here’s an idea of what you can watch on NOW TV. Unlike other streaming services, NOW TV lets you watch live TV, and you can get broadband through NOW TV, too. But you can also just sign up to use it as a streaming service. Not sure what the difference is between Sky and NOW TV? Read our guide to Sky vs NOW TV. Find out more about what’s on Netflix. You can watch Netflix on lots of different devices, including TVs, games consoles, laptops and mobiles. Amazon Prime Video offers a number of original series and films, too, plus the added perks of a Prime membership, like free shipping. Unlike other streaming services, you can also buy individual films or TV series (or even single episodes) to watch if they’re not included in your Prime membership. Prime Video also offers flexible memberships, including monthly or annual memberships for Amazon Prime or monthly memberships to just Prime Video. Read our guide to what’s on Amazon Prime. Based on the novels by Philip Pullman. There’s plenty to get your teeth into. But misses out on Best Picture.